ShoutEm just published a great infographic on the state of the mobile app world. It tracks down the highest rated apps on each of the major app stores. No surprise that Angry Birds has the top berth at the iPhone store with 4.78 stars. Rovio has done an amazing job of maintaining the stickiness of the AB experience with continued content refreshes. More surprising is Google Maps rating of 4.5 on the Android Market. Given the diverse content available, an included mapping app is the top rated? Granted, Google Maps on Android is fantastic. It’s enough to make executives from TomTom, Garmin, and Magellan come together for group therapy, if they can find each other on the map. When I contrast the user experience of Google Maps on my iPhone to my Nexus S, it reminds me of using Office on a PC and a Mac, one is always lagging the other to the annoyance of that market slice. t puts the crack in Crackberry but considering the other applications available, the free included walled-garden messaging app is the best offered in that ecosystem? With the new PlayBook finally in people’s hands (check out the upcoming Argus Insights coverage of the First Week of Play with the Playbook) will developers finally feel incentivized enough to focus on the RIM platform. Our research at Argus Insights has shown that the app ecosystem is critical for refreshing the user experience on tablets and smartphones. Most products rapidly fall out of favor as new and shiny products come out on the market. The iPhone bucked the trend and for the most part, all smartphones launched after it have the same pattern of apps refreshing the experience and prolonging the delight in the market. Look for a future post on this very phenomenon. I had the pleasure to both attend and present at a Gilder-Forbes Telecosm conference several years ago. One of the presentations that stood out in my mind was a presentation by Paul McWilliams, the editor of Next Inning Technology Research. He showed some incredible data on the boom and bust cycles in the semiconductor industry that were driven by the enterprise market purchase cycles. What made this incredible was that the volatility of the cycles was being damped out almost to a smooth line. The rationale was how the consumer market was driving the chip industry to a more consistent demand profile and pushing growth across the entire sector. This was back in 2005 when credit was cheap, houses were expensive and everyone was eating iPods for breakfast. Paul’s message was that the consumer was driving the bus now instead of the enterprise and the ride to future growth would be less bumpy. We know now the bus was headed towards a cliff in late 2008 but that doesn’t mute the essential insight Paul gave us, consumer demand for technology has eclipsed that of the enterprise. Initially this was driven by consumer demand for enterprise products, such as Palm Pilot PDA’s and laptops combined with the additional digitization of media heralded by the explosive adoption of little white earbuds across the globe. Over at AllThingsD we are hearing about the latest lawsuit from Apple against their competitors. Why target Samsung and not Dell or Motorola? 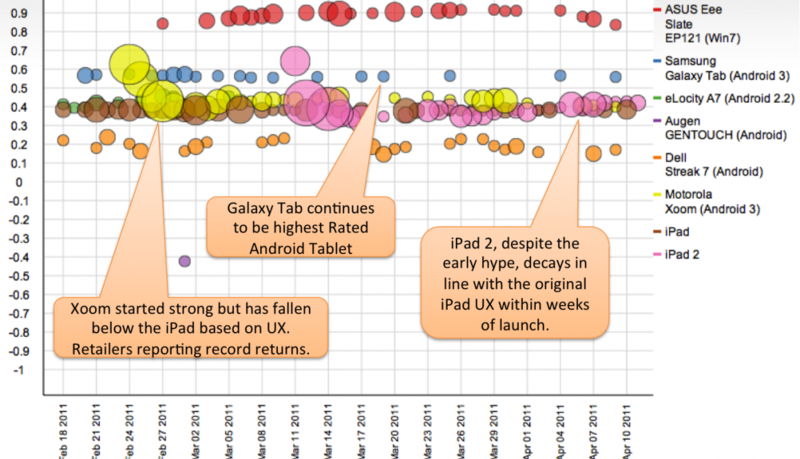 Our analysis indicates that the Galaxy Tab poses the greatest experience threat to the Apple iPad. Even with the launch of the iPad 2, user response to the Tab still exceeds that of Apple’s offering. Granted, it is a smaller but passionate population of Tab users compared to the hordes of iPad faithful, but this is how Android overtook iPhone in the smartphone business. Rocket Hindi! Top Selling Hindi Course! 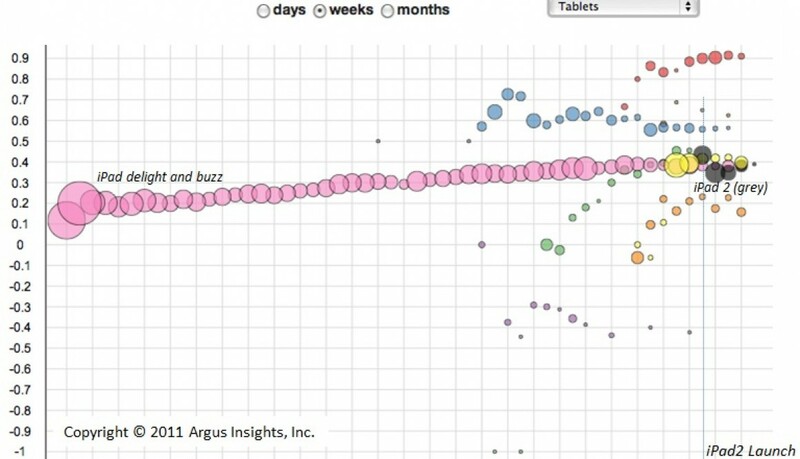 various tablets on the market changes over time. The y-axis is a measure of end user delight that swings from -1 (I hate this experience) to +1 (I bought a round of iPads for everyone at the bar!). The areas of the bubbles represent the amount of buzz for a given day for that product. Since we’re tracking the cumulative delight created by each of these products in the market, we can see when the market falls in and out in love with the various tablets. You can see that the Android powered tablets are chasing the iPad with a vengeance, some with greater success than others. The anomaly is the Asus Eee Slate powered by Windows 7. For the enterprise user, this has been the tablet of choice because of the seamless integration with the rest of the Windows/Office ecosystem. As you can see from the analysis, Windows powered tablets bear watching over the coming months. We will continue to track the changing UX Landscape for this segment, with the RIM PlayBook analysis available later this week. Cisco just announced the death of Pure Digital’s Flip Camera product line to refocus their efforts on other consumer markets. Christina Warren over at Mashable provided an insightful analysis as to why the death knell was heard on this maker of future Speilbergs and Bays. Her point was that the Flip was the stop-gap until smartphones caught up with the casual video market, much the way that Steve Jobs created the iPhone while waiting for the iPad to be feasible. This is a pattern we’ve seen over and over in the consumer electronics market, we fall in love with new devices and experiences eerily reminiscent of the summer loves of Grease. We have deeply passionate relationships with our smartphones, laptops, mp3 plays, especially our Tamogotchi’s, and then some new young thing struts by with a multi-touch dashboard, 4G rims, dual overhead cores, and we’re in love all over again. Here’s an example from the dark ages of smartphones, when Palm was still Palm (in fact they had just become Palm again two years prior after buying Handspring) and the iPhone was just a presentation that scooped all of CES in January 2007. 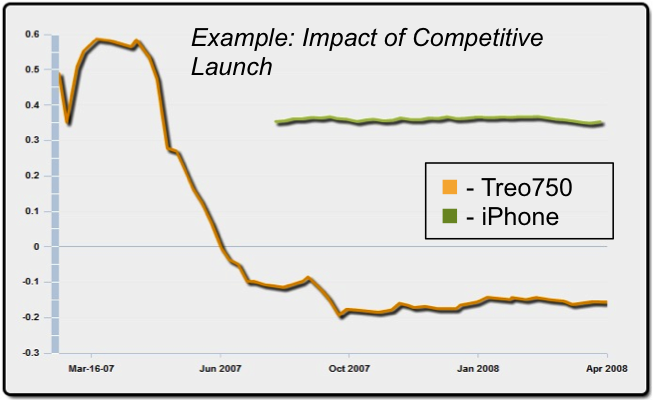 This is real data from real users baring their souls about the lost love of the Treo750 in the face of the arrival of the iPhone. As the iPhone got into peoples hands, the smartphone user experience was radically redefined. This is what happened to the Flip, new capabilities came out that changed our expectations about what device we wanted to use to capture video. When Apple booted the video camera off the iPod nano in favor of the multi-touch stamp form factor, that signaled end of a stand-alone camcorder market of any significant size. That being said, just like summer love, there will be significant nostalgia for the Flip. I know for capturing my daughters in action, the Flip is a lot more convenient than my iPhone 3Gs or Nexus S, that is if I remember to bring it with me. Similar to remembering those product loves from past summers, it’s great to do but who has time? 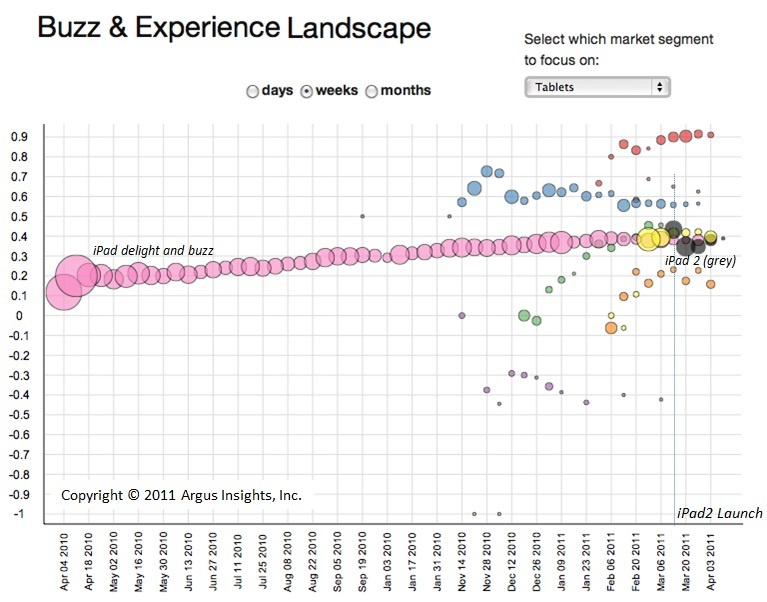 Argus Insights releases iPad 2 Launch Report – "Buy it or skip it?" We have the iPad 2 launch report now available, which shows how customers feel about the iPad 2, and how it stacks up against other tablets – including the original iPad. We are not offering up yet another pundit prediction for the future of the tablet market: our analysis comes entirely from what users say about their experiences with their tablet products. The results might surprise you! Please visit www.argusinsights.com to retrieve your copy. Let us know what you think and what other analyses you would like to see.